The money… It slips through my fingers (insert Mulan reference here). I’m no longer in NYC. 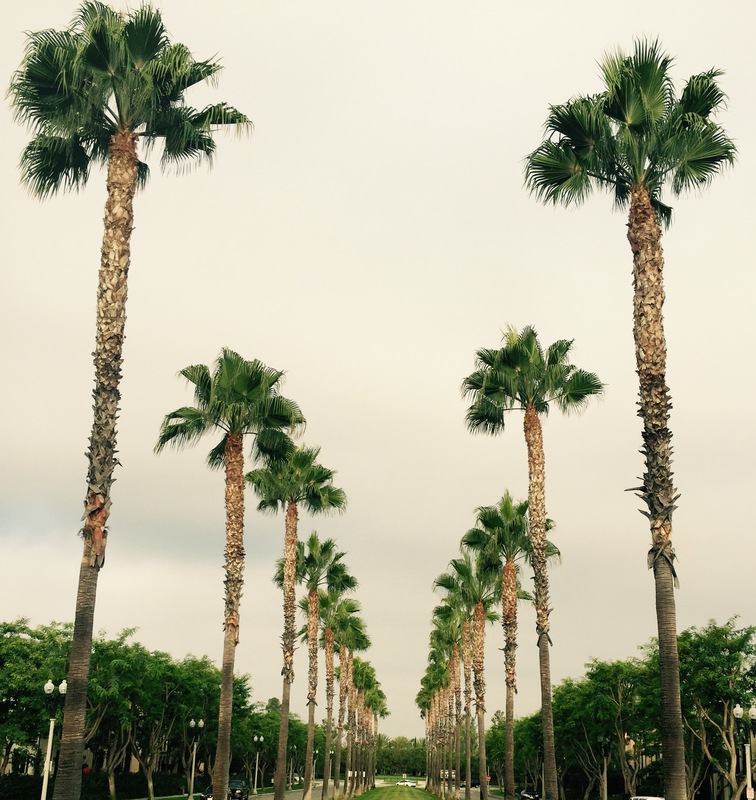 I’m a New Yorker in California… Which, I guess isn’t all that rare – people relocate all the time. I think I still might be on New York time, as I woke up at 7AM naturally. I went for a walk, and it feels kind of like a waking dream. 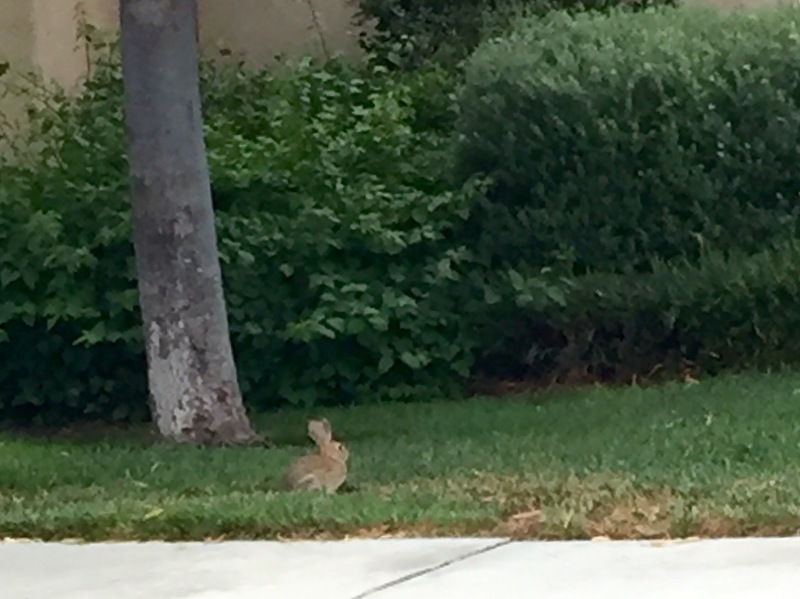 There’s hummingbirds and bunnies just going about their business in the neighborhood. It really does feel surreal. Everything feels different – even my sweat feels different (it was explained to me that this is because there’s no humidity here. Bizarre). It’s so beautiful here. It’s so serene. I feel less like I’m being smothered by a sea of angry people. I have a support system here. I have a support system in NYC too. I haven’t been able to do many doll things while here. I think it’s because if I’m not trying to get my life in order, I’m napping because I’m exhausted. Once I get settled (hopefully soon), I’ll be able to take my girls out for some photos. 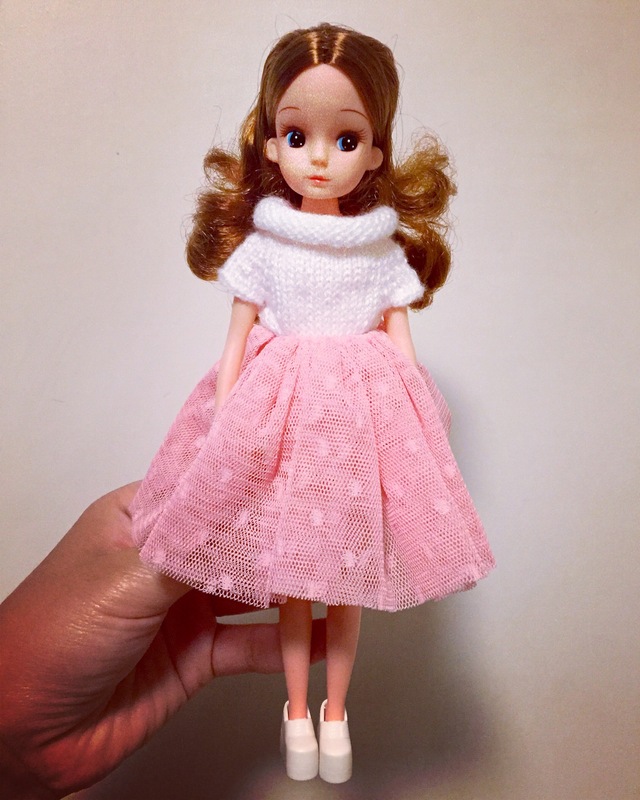 Every weekend, I try to redress my dolls, that way I can figure out what items in the doll wardrobe I love, get a better sense of what things go together, and it’s quite relaxing to redress them while sipping a glass of wine and watching some YouTube videos. Prisma (left) and Finley (right) are this week’s best dressed girls ^^. Prisma is wearing a checkered shirt and tutu by MINIJIJO with a pink hair clip. Finley is wearing an adorable shirt made by my friend, a Missblythe2012 jumper skirt and Qmagicdoll shoes. I love how different these two girls look! They were both customized by different artists, and so their faces are quite different styles. I’m so in love with Prisma, but somewhere down the line, I may give her a licca body (her neck wobbles on her current body, so I’m not sure that I would want to do an arm transplant). I’m slowly decluttering my things in order to move with less. 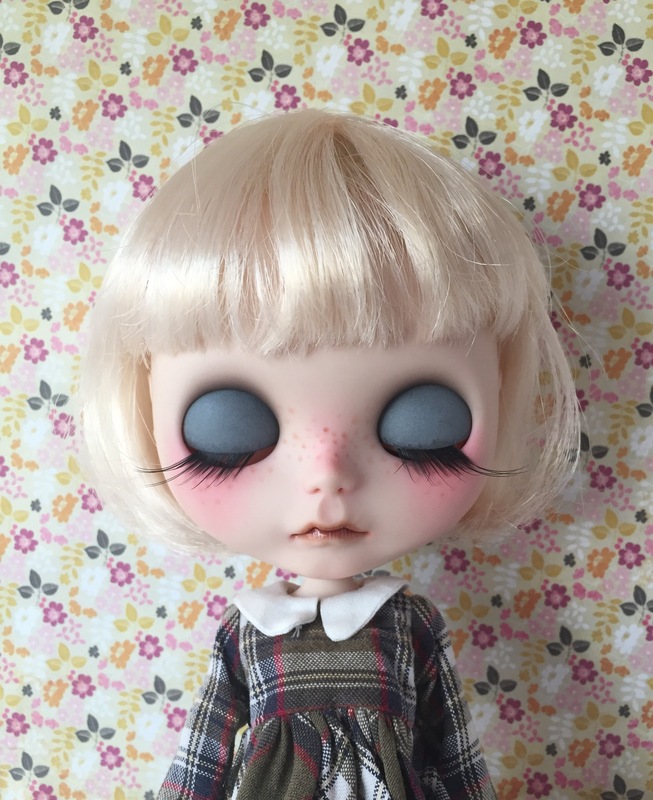 I do foresee myself having to leave some Blythes and coming back for them later or having them mailed to me, but it’s so hard for me to choose who to bring. Now that the move date is less than a month, my anxiety has kicked up to over level 9000. The less time between me and my move, the less I feel prepared, and the more real the changes feel. I’m scared… Because change is terrifying. But I see it as having to choose between staying in my current city and living with depression, or relocating and dealing with anxiety. Staying feels like giving up (just because sameness is easier), and I don’t want to give up. I want to someday be happy, and I don’t think that where I’m living right now will lead me there. Lol. Check out my Fitbit. 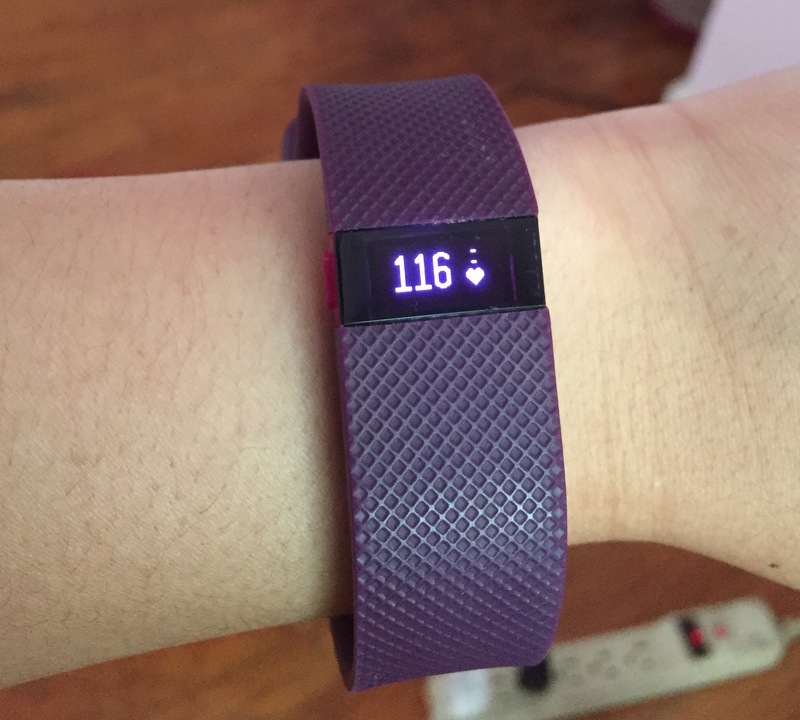 This is my heart rate as I sit in my chair, panicking (for reference, my resting heart rate is 63 bpm). The one thing that’s changed for me though, is that I’m also feeling bouts of excitement mixed in with the periodic worry. I think I know that in the future, I will be glad that I’ve taken a risk in my life, after playing it safe for so long. She’s so delicate looking. I’m not sure any of these names will fit, because when I look at her, these names don’t come to mind (except Prisma, for some reason… But it’s such a oddball name, and also the name of a villain in Sailor Moon). I guess I’ll think some more (way open to suggestions! !… help…). I’m in a weird funk right now, I think because big changes are coming my way and fast. I know that a lot of my negativity stems from my anxiety, but I can’t turn it off or shake it off. I try to take a day by day approach to life, and do the best I can today so that I might be better prepared tomorrow, but sometimes my “best” doesn’t seem good enough. 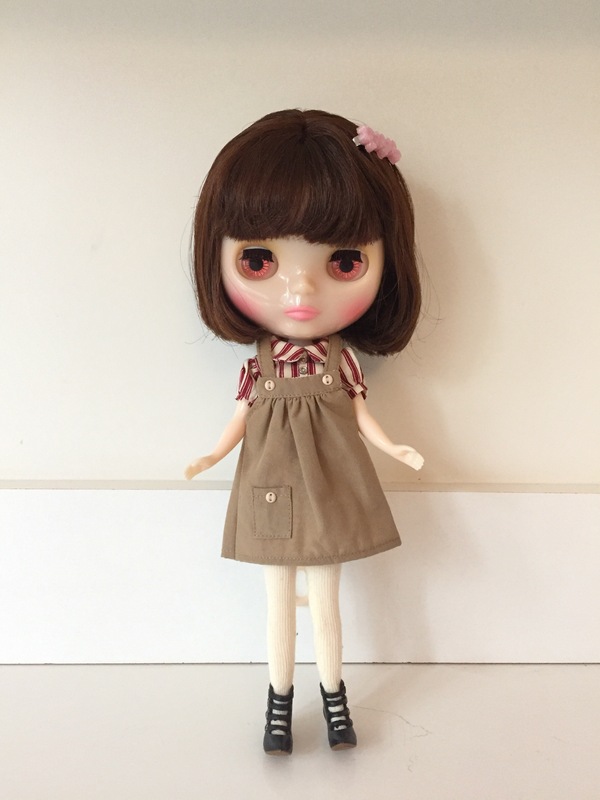 Even as we speak, despite being thrilled to have this beautiful new Blythe in my collection, I’m worried about safely transporting her with me during my move. Yeah… I’m feeling weird. I’m completely in love with this color way. It’s well on its way to becoming a shawl ^^. I worry a lot. I am a huge worrier, and always have been for as long as I can remember. The feeling is part of my everyday, and since I’m so inside my head, it’s hard for me to discern the nonsense from the serious… So everything becomes categorized as a Code-Red-Danger-Will-Robinson situation. I’ve been in something of a slump lately when it comes to doing those serious business things – in my case, really thinking and planning out my near future and making preparations for them. I always try to take things one step at a time, since there’s no point in freaking out about step 10 when I haven’t even gotten to step 1. It wasn’t her situation in particular that I identify with, but her message and her outlook that I admire. Faced with tough choices, she ultimately did what’s right for her in striving for happiness, and that’s something I think is really brave. 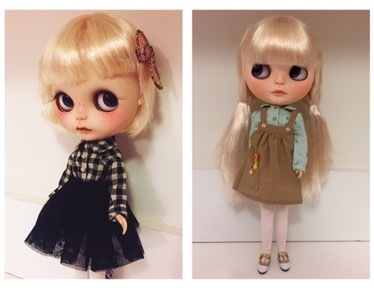 Another thing I did to procrastinate was redress a couple of my dolls. 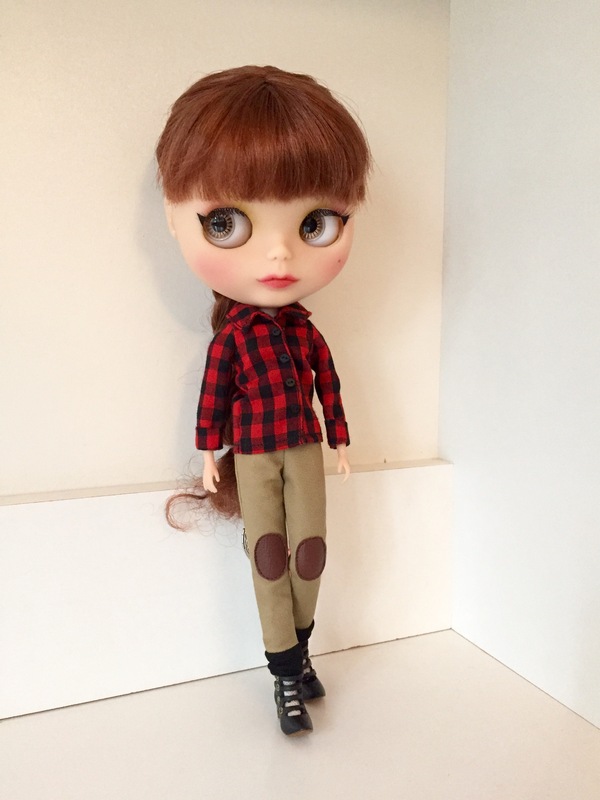 Rory (top) is wearing a shirt by MINIJIJO, pants by Missblythe2012, and stock shoes. I put her hair in a fish tail braid. Elowyn (bottom) is wearing a shirt by C’mon Dolly, skirt by Missblythe2012, and stock shoes (I actually switched Elowyn’s shoes out to pink converses and put these ankle boots on Rory). I like how Rory looks in red! I have to get back to crafting for my dolls, but making human size things (socks…) has kind of taken over my life XD. Glad to be starting the work week on a Tuesday, and I hope everyone had a great holiday weekend or just weekend (depending on where you are in the world)! The weekend – It’s been hell-week at my job. Ordering yarn from Knit Picks – I think I’ll bite the bullet this weekend! My sister said she would dye yarn with me, so I plan on getting a few skeins of bare yarn ^^. Also, I’m going to treat myself to some sock yarn! I want to attempt to knit myself some socks. The BJD eyes that I ordered for my Hujoo Janus Gato – They’re currently at customs… Hopefully they come next week. Quite possibly making a 2 hour trek via public transportation to Gundam Planet in the next state over for some MSC (because I ran out… also I kind of want to check out this place). Receiving a swap package from a dolly friend. 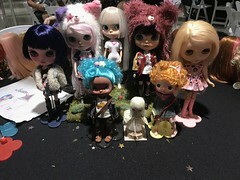 ^^ She’s already received the package I sent to her, and tried some of the items on her dolls. 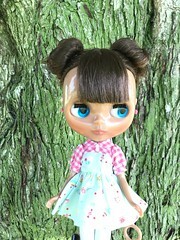 I love seeing photos of other people’s dolls wearing things I’ve handmade. The below are from her flickr ^^ (I made both hats and the white sweater in the photo on the bottom). 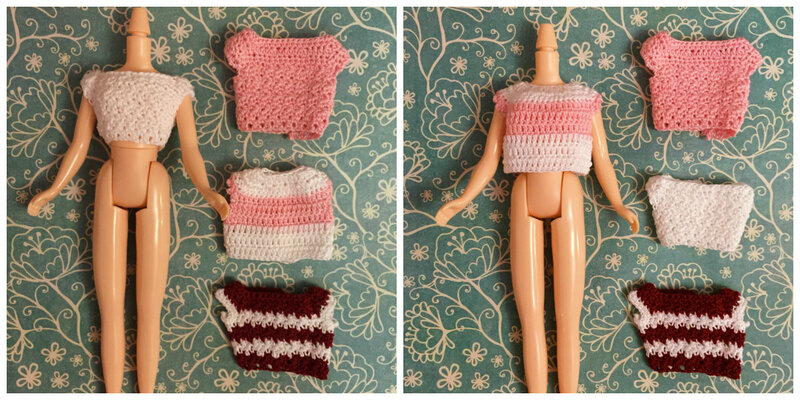 A weekend of knitting while cuddling with my cat and watching doll-related youtube videos. 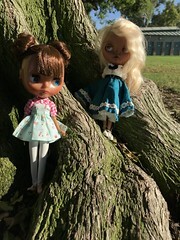 Finally head out to the nearby park with one or two of my Blythes and have a photo session (most likely at 9AM in the morning to avoid them crowds). Here’s to a very quick Friday! I purchased a Jetoy Choo Choo coloring book last month at the anime convention I attended. After seeing another blogger’s coloring book as well as this Huffington Post article (which coincidentally just shows up on my facebook feed, even though it’s been published a year ago), I decided to crack open my own. And then I almost closed it, and shelved it again, LOOK AT ALL THE LINES AND THE SMALL SPACES :(. The book itself is super adorable! 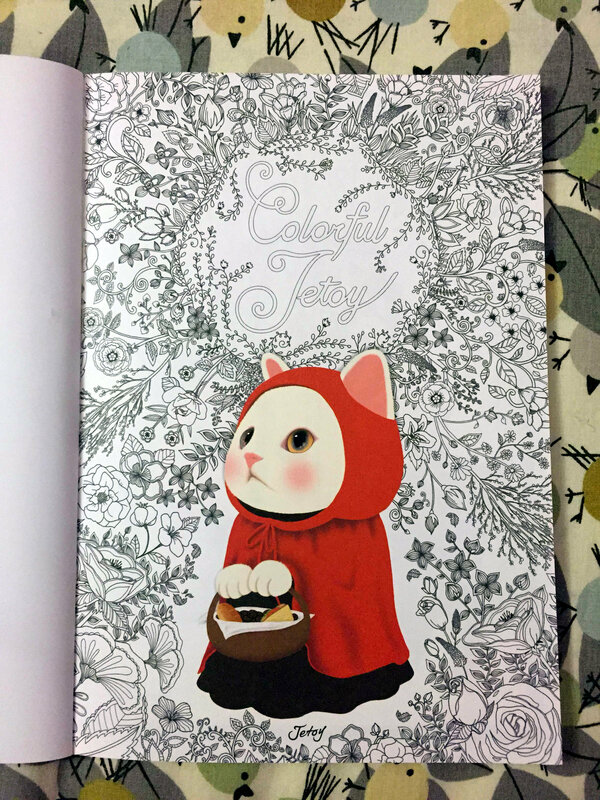 I love Jetoy Choo Choo cats, and even black and white, this coloring book is really pretty. I actually started coloring the first page and I’ve hardly made a dent in it because of how detailed the drawing is. Coloring is more absorbing than I thought it would be – I guess because it draws your focus to what colors you want to use next, if those colors work with each other, and staying in the lines. I really don’t want to mess up my pretty book, so I must have been concentrating doubly hard. I wasn’t really thinking of much else as I was shading in the page. For me, that’s the mark of a great activity for staving off anxiety. To be honest, I actually got tired from working on the page above, and I went to sleep right after I put everything away (which, is kind of a big deal to me because I usually have trouble falling asleep). I also finished crocheting this guy over the weekend! The pattern can be found on this website. I wanted to try making this amigurumi because I was interested in the construction of the bear. 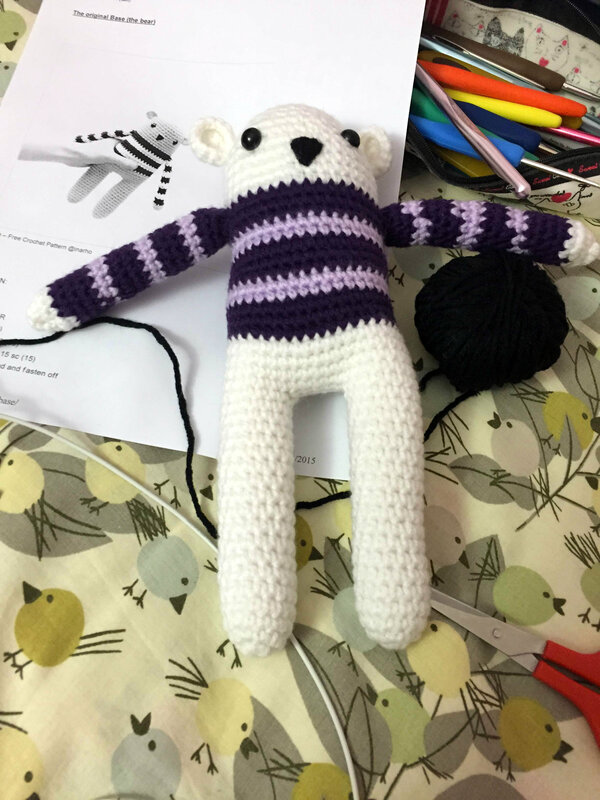 This bear doesn’t really have separate parts that need to be stitched together, like most amigurumi. I thought the pattern was relatively simple, though some of the instructions were a bit unclear (I kind of struggled with the ears, because when I made them as per the instructions, they looked a bit funky. In the end, I decided to make the ears as I would normally make bear ears if this were a hat or a different amigurumi bear), ^^ I didn’t have brown yarn, so mine is a polar bear. For me personally, crocheting can sometimes be a way for me to sidestep the stress of the every day – whether it’s a bad at work, worries about the future, or generally negative thoughts. I am someone who struggles with anxiety in varying degrees. It’s not so bad now, and I’m glad to say that for the past two years, I’ve had more good days than bad (which is definitely more than I could say about the period of my life prior to that. #darktimes #sorryIcouldnthelpmyself #neededtoinsertjokehere). I didn’t expect crocheting to be therapeutic in the least. I picked it up on whim when my best friend asked me if I was interested in learning how to crochet with her. We sat down in her living room with our newly purchased hooks and yarn, and proceeded to watch a handful of Youtube videos explaining how to chain, single crochet, half double crochet, and double crochet. And then, my hobby turned into something of an obsession (OR maybe I should refer to myself as an extreme hobbyist, because it sounds slightly cooler and less unstable). I’m not that good at crocheting. It takes me a while to complete projects, because I’m so finicky about mistakes (in that there must not be any) and my hands aren’t very nimble. When I’m working on amigurumi or a new pattern especially, I tend to concentrate very hard on the pattern and the hook and yarn I have in my hand. 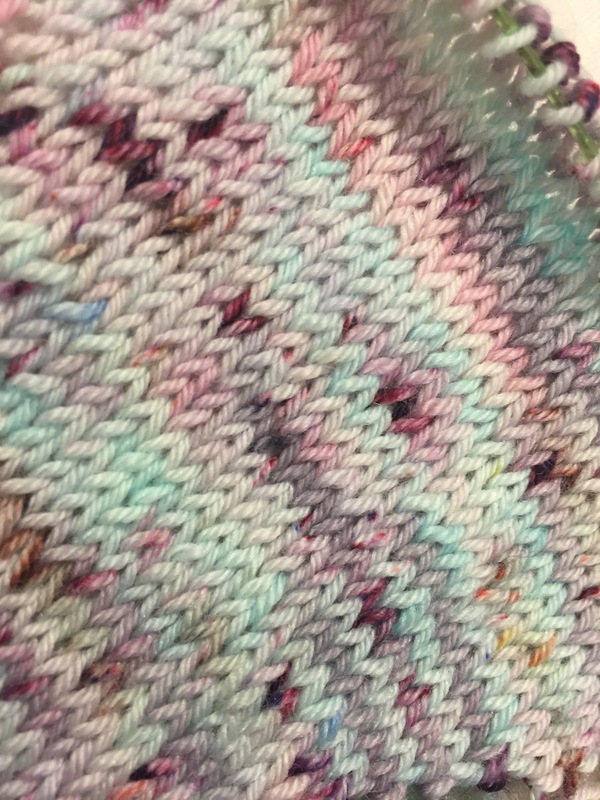 On the rare occasions when I attempt to freehand a project, I get lost in thought trying to picture where the increases and decreases should go in my row. When I really get into crocheting, my mind is so focused on what my hands are doing – making sure I don’t drop stitches unintentionally, making sure I don’t suddenly have more or less stitches, checking the gauge, and keeping track of my rows. This activity doesn’t really leave much room in my head for worries that shouldn’t be worries to the extent that I build them up to be. I wanted to share the tops I’ve crocheted! I must say that having a spare body is terribly convenient. This particular body is a stock Takara body that came with Finley. The top on the left was worked from the bottom up, and the one on the right was worked on from the top down. All of them need snaps, except the dark red and white striped top at the bottom. I plan on sewing skirts to one or two of these tops. I’m pretty pleased with how they turned out though! It took some hemming and hawing on my part trying to figure out where to put the increases and decreases and how to finagle the arm holes, but totally worth it ^^. (I’m considering sharing the pattern here or on ravelry, but they’re pretty simple so I’m not sure if I’d really be adding anything to what’s already out there).